Each directory on a FAT/FAT32 or an exFAT volume can be considered as a specific file, describing the contents of the directory. 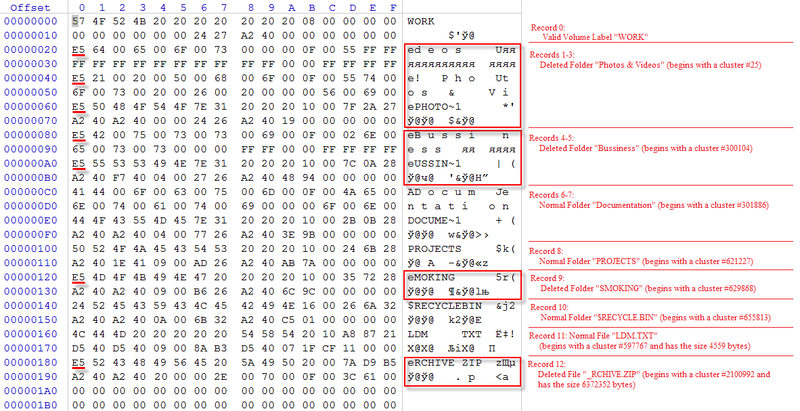 Inside this descriptor there are many 32-byte records, describing every file and other inner folders. When you delete files this data is not being fully erased. It is just marked as deleted (hex symbol 0xE5). That's why data recovery software can detect and use these records to restore file names and full directory structures. In some cases dependent on whether a space where item located has been overwritten yet or not, files and folders can be fully or partially recovered.. Active@ KillDisk makes data recovery impossible by using an algorithm that wipes out all unused information from directory descriptors. Active@ KillDisk not only removes unused information, but also defragments Directory Areas, thus speeding up directory access.